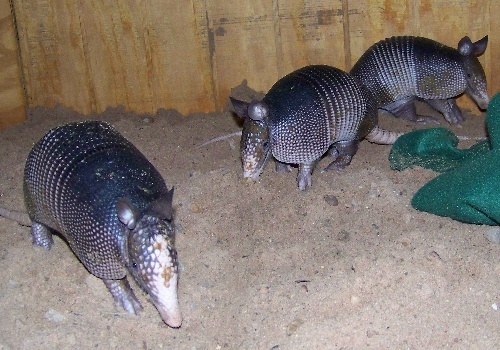 Armadillos, Nine-banded Armadillos, Dasypus novemcinctus. These three grunting girls came in as orphans, found still trying to suckle from their deceased mother. Now the identical siblings are excitedly learning how to hunt insects and dig out other treats in their sand-filled pen. The armored trainees are already quite adept at what most armadillos do for 19 hours a day: sleep. Piled on top of one another, twitching with each particularly exciting dream, they manifest a comical scene of tranquility. Although Shangri-la for an armadillo is a densely shaded wetland, packed full of grubs in easily probed sandy soils, these armored omnivores scuttle through thorny scrubland to bottomland woods to prairie grasslands and, most likely, your backyard. Wherever they may roam, these relatives of anteaters and sloths use their 32, peg-like, non-enameled molars to chow down on their insect-rich diet. In fact, 90 % of what they consume directly benefits pest-plagued landowners: fire ants and other native ants, grubs and destructive insect larvae, caterpillars, termites, and even the occasional carrion. In the process, armadillos aerate soil, helping with seed germination and successful sprouting. However, when pickings are thin and/or when drought conditions harden soil, these schnuffling mammals may seek out the softer soils and insect-laden strata of your flowerbeds, well-manicured lawns, or vegetable gardens. 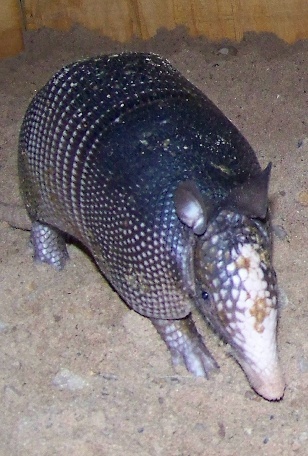 Armadillos generally are only a temporary disturbance to the suburban landscape, continuing their foraging elsewhere once a locally abundant prey base has been fully exploited. For those who are a bit impatient or cannot tolerate the diggings remaining from the armadillo�s free pest control services, there are several humane and cheap methods to deter the grubbing of these grunting neighbors. If an armadillo is focusing its nocturnal searchings in a limited area, you can fence the intruder out. Ensure that the fencing has a rigid overhang that extends for a foot or more at a 45 degree angle and be sure to bury the fencing one foot or more to prevent the armadillo from either climbing over or digging under the barricade. For a larger area of disruption, you can sprinkle cayenne pepper, any type of chili powder, or Critter Ridder (http://www.havaheart.com) over the affected region: one snort of the burning powder and the armored excavator won�t be back for more. For more determined armadillos, a homeowner can remove tall grass, brush, and rock piles, which provide areas of safety for these mammals. In well-aired, open spaces, mothballs or ammonia-soaked rags can be strewn about to offend the sensitive sense of smell of these insect-seekers. NEVER use mothballs, ammonia, or any strong-scented alternative to evict an armadillo from a burrow as it can cause serious health problems or even death to underground inhabitants, especially juveniles. Once an armadillo has settled on a territory, he/she may construct as many as 15 burrows in a ten-acre range. Although most of these excavations serve as emergency hiding areas or temporary retreats for relief from the heat, some tunnels can wind 20 ft deep and have up to four entrances to an elaborate network of subterranean domains. In February to April, female dasypodids give birth to quadruplets 3-5 ft underground in a chamber delicately lined with grass, leaves, and soft organic debris. Burrows not only provide shelter to armadillos and their offspring, but also furnish homes for countless native wild denizens of Texas, from (my favorite) skunks to toads to burrowing owls. Unfortunately, the tunnelings of armadillos can also cause havoc for cattle ranchers and the foundations of homes. Fortunately, many of the same solutions to problems with foraging armadillos are applicable to situations involving burrowing individuals. Once a habitat is deemed uninviting as a homestead, an armadillo will move on to better terrain. Removing food sources (i.e. pet food left outside) and zones of safety (tall vegetation and brush/rock piles) is the first step towards evicting burrowing armadillos. A generous sprinkling of cayenne, chili powders, or Critter Ridder in excavated areas is a more direct means to eradicate further digging activities. If these methods fail, volunteers at Dove Key Ranch Wildlife Rehabilitation are always prepared to coach you through mitigating armadillo damage. With a bit of patience for your grunting, grumbling armadillo neighbors, you can enjoy free pest control and entertainment, while protecting a distinctive feature of the wilds of Texas.